When I'd been in Japan about a year or so, my friend Marisa told me that one of her friends from university was going to be doing a study-abroad in Japan. Imagine our surprise when she turned out to be living right in my city! I offered to guide this friend, Meghan, to Kobe to meet up with some friends of her parents, as I was planning on visiting Kobe for Pink Ribbon Day. Kobe Port Tower was going to be lit in pink, and it was something that I wanted to see. I met Meghan and her friends from 〇〇 University just before the light-up, and after seeing the Tower and greeting her guests, we went out to Bikkuri Donkii for dinner. I was intrigued by the 'Irish Chocolate' drink on the menu. Did it have Baileys in it, I wondered? Kahlua? Was it some special kind of chocolate that was better than, say, Belgian or British? I decided to ask our server before I ordered it. When she arrived, I managed (in my not-great Japanese), to inquire "What is the Irish Chocolate?" 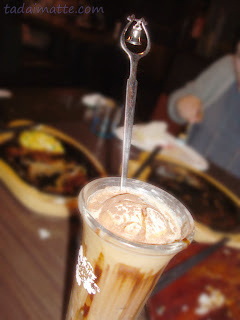 The server explained that it was a chocolate drink made with cream. "OK. So what is in it?" "Wait, but why is it 'Irish' chocolate, then?" She didn't understand my question at all. "Eh?" "Why is it called Irish?" She just looked at me, confused, so I thought maybe it was my poor Japanese (which it was, but this didn't help). I asked "What is 'Irish' about it? Does it have Irish alcohol? Irish flavour?" Frustrated, I ran out of ways to creatively word my question. "Does it taste like Ireland? What does it have in it that's Irish??" A helpless shrug. The waitress didn't seem upset, just confused - my table, however, was almost in tears laughing. Feeling quite incompetent in front of my new friends, who were all exchange students and sure to be totally fluent in three months while I continued to struggle with reading my phone bill, I decided to get the drink and figure it out myself. It was slightly coffee-flavoured, a blender drink not unlike you might get at Starbucks. Right, coffee - you know, like Irish Coffee, except not quite. Only later did I realize where we had gotten our wires crossed - that to me, Irish means 'something from Ireland,' whereas to her 'Irish' was just a curious English word whose meaning was a mystery. In Japanese, to say something has the properties of a place, you would say the name of the country itself - in this case, airurando (Ireland) kara or airurando no mono. Had I used the Japanese word for "Irish" instead of what was printed on the menu, I would certainly have had better luck. At least the drink was delicious. As for my new friends, Nicole and I are still in contact, and Meghan and I still get together on Skype every week to study for the JLPT, so if I must be incompetent, at least I'm in good company!